Interested in research showing that merit pay is tied to socioeconomic status? On January 31, the Houston Independent School District announced annual instructor bonuses through its ASPIRE program, a merit pay program for teachers funded through state and federal grants and partly through local funds. Statistical analysis suggests that schools with the highest bonuses on average were wealthier, whiter and more selective than the district as a whole. The ASPIRE program was created in 2006 to reward teachers for having students that showed the most academic progress. Most of those benchmarks are tied to performance on standardized tests, primarily the Texas Assessment of Knowledge and Skills (TAKS) and its successor, the State of Texas Assessment of Academic Readiness (STAAR). The program has continued despite initial teacher complaints that ASPIRE was implemented in a top-down fashion with little input from classroom teachers. In 2013, core classroom teachers could earn bonuses up to $13,000 for improving performance. According to HISD’s press release, the following 15 schools earned the highest average bonuses across their respective faculties. Among elementary schools, West University, Field, River Oaks and Scarborough and theTexas Connections Academy earned top honors, while Burbank, Stevenson, Ortiz, Energized for Excellence and Energized for STEM Academy West reported the largest bonuses among middle schools. At the High School level, faculty at DeBakey Health Sciences and Health Professionals School, Challenge High School, Carnegie Vanguard High School, Sharpstown International High School and the High School for the Performing and Visual Arts recorded the largest average bonuses. Thesis staff used data gathered from the National Center for Education Statistics and HISD to compare characteristics of the top scoring schools with the district. We looked at the percent of economically disadvantaged students, as measured by the percentage of students who qualified for free and reduce rate lunches; the racial breakdown of the student body and whether or not the school was selective in its admissions (i.e. whether it was a charter or magnet school that has the ability to deny entrance and remove failing students). 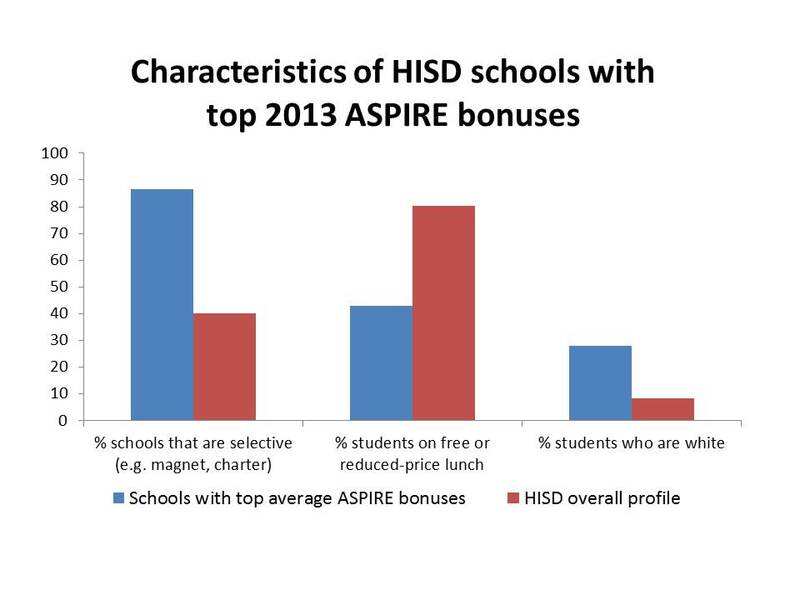 All the schools among the top 15 schools in ASPIRE bonuses had more favorable initial characteristics than HISD as a whole. On average, the 15 top schools had 45 percent of their students economically disadvantaged, while the district as a whole had 80 percent of its students receiving free or reduced-price lunch. The highest bonus schools had three-times the percentage of white students on average than HISD overall – 27 percent to 9 percent. Finally, 87 percent of the schools in the highest bonus group incorporated selective admissions, more than double the 40 percent of schools in the district at large. Overall, the statistics seem to show that schools with fewer disadvantaged students (and the ability to select their student bodies) seem to make the most educational progress, which leads to larger bonuses. These numbers just analyze the top 15 schools for 2013; so they shouldn’t be considered determinative of the overall effects of the ASPIRE program. It’s also worth noting that several schools among the top performers buck the trend in one or several areas. For example, Burbank and Ortiz middle schools, which are both high performing schools, serve overwhelmingly Hispanic populations that are less than the HISD average of white children. The two schools also have a relatively large percentage of students on free- or reduced-lunch programs at 65 and 62 percent. However, the overall picture is suggestive, and is line with conclusions drawn from an otherwise positive evaluation of ASPIRE last spring conducted by Houston Education Research Consortium at Rice University. That study noted that larger bonuses seemed to help teacher retention and attendance, while also noting the disparity in awards between teachers at underprivileged schools and the rest of the district. It seems like it’s easier to teach richer children enrolled in selective schools. But according to the Center for Education Compensation Reform, one of the goals of ASPIRE is to encourage highly qualified teachers to locate and remain in underprivileged schools. How providing large bonuses to faculty in wealthy schools facilitates this goal is an open question – and other districts moving to a merit pay model, like the Dallas Independent School District.